The latest generation of Protector Premier and XStream hoods are better than ever. These fume hoods share a variety of new features—the most visually obvious being a huge 37.5” unobstructed viewing height into the hood’s interior and exterior depths reduced 1.5” to yield more aisle space in front of the hood. Along with these visual improvements, other less obvious changes have dramatically improved the hoods’ functionality. We’ve redesigned the sash. These hoods have a new anti-racking sash suspension system and captured counter weight for whisper-quiet operation. Both hoods are also available with chain and sprocket suspension, auto-return system, combination sash, or Intelli-Sash™ automatic sash positioning system. We’ve redesigned the air foil. The Eco-Foil™ is an aerodynamic sill designed to correct the naturally occurring turbulence at the threshold of a fume hood. The Eco-Foil is 33% smaller than our previous generation air foil. It offers cord management, enhances safety by promoting the use of the interior of the fume hood, and reduces energy consumption 7-10% over flat air foils. The redesigned Protector Premier Hood still features its versatile one-piece molded polyester resin liner. The liner’s sides, rear and roof as well as the duct collar are one continuous component. Without seams and joints, this one-piece liner is resistant to deterioration and easy to clean. Additionally, the Premier’s polyester resin liner has superior chemical and heat resistance. Models are available with our without integral blower. Integral blower models are offered in 4’, 5’ and 6’ widths. Models for use with remote blower are available in 4', 5', 6', and 8' widths. In addition to the enhancements noted above, we also addressed the baffle design on this hood. The result of these adjustments and component changes is a new Protector Premier Hood that meets the SEFA definition of a high performance fume hood. Pull back the curtain on this level of performance, unsurpassed clean-ability and chemical resistance, to find a fume hood worthy of the name Premier. View the Protector Premier Hoods information. The Labconco Protector XStream is completely redesigned to provide unsurpassed containment and energy efficiency. The reinvented upper dilution component, Clean-Sweep sash handle and Clean-Sweep™ sash track all improve the XStream’s containment. However, primary enhancements in this area are seen in the dual baffle design. With dual axis zoning of tapered entry slots, the XStream achieves vortex mitigation, promotion of horizontal airflow, and an optimization of the face velocity profile called Opti-Zone™. 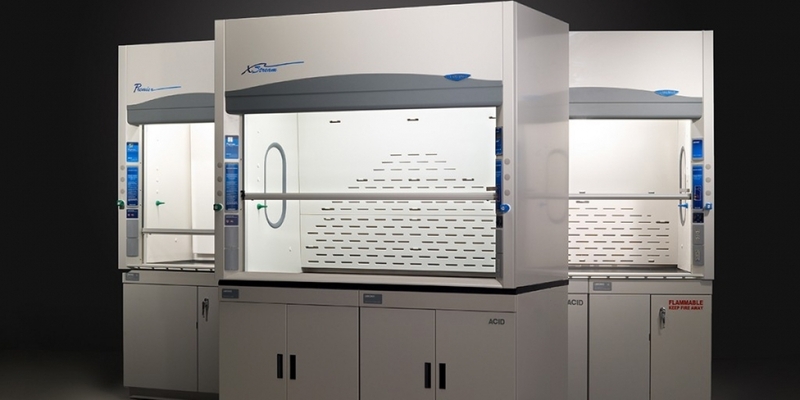 There is not a written standard that would suggest it is safe to operate a fume hood below 60 fpm, however, as a measure of insurance to those operating their hoods at low face velocities, Labconco subjects all Labconco fume hoods to containment tests in a variety of adverse conditions and face velocities. When the Protector XStream is subjected to the ASHRAE 110 test method, there is no detectable level of tracer gas outside the fume hood, even at face velocities of 40 fpm. Unlike face velocity, the volumetric rate (CFM) is directly related to the energy consumption on a fume hood. Achieving 60 fpm face velocity on a 6' XStream, with the sash in its full open position, requires only 690 CFM. Regardless of the desired operating face velocity, this hood will yield the lowest required CFM, making the Protector XStream Labconco’s most energy efficient high, performance fume hood ever. View the Protector XStream Hoods information. For details about our line of Protector Premier and XStream Laboratory Hoods, contact our fume hood experts.